Just imagine having the opportunity to work with a restaurant you love to come up with your ideal menu incorporating all of your favourite foods. My dream came true when Executive Head Chef Chris Toner and myself got together to plan an event at Aberdeen's Adelphi Kitchen. From the outset Adelphi Kitchen was committed to following in the footsteps of The Courtyard and La Stella to run foodie events with their suppliers and close friends. The first of those was Meat Feast #1 with Marcus Bawdon of www.countrywoodsmoke.com. I am delighted to have been given the opportunity to partner on event number two. Black pudding, scallops, crackling, bacon, prosecco, wild garlic, crab, langoustine, elderflower, avocado, dirty steak, rhubarb, gin, popcorn, blue cheese, peanut butter, tea, vintage. These are a few of my favourite things. Yours too? Might see you there! 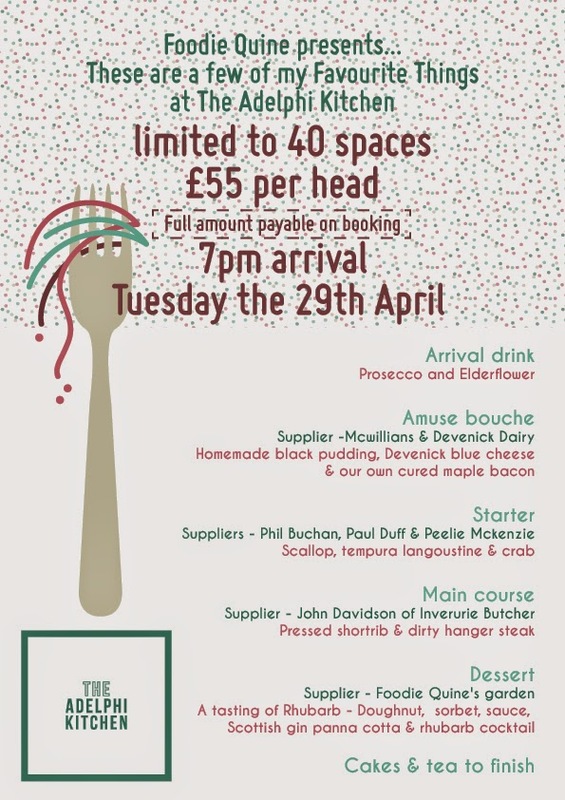 Adelphi Kitchen and Aberdeen Food Blogger Claire Jessiman aka The Foodie Quine present a four course taster menu highlighting seasonality, locality and a passion for provenance. Forget about raindrops on roses and whiskers on kittens. Claire's favourite foodie things include black pudding, scallops, cheese, bacon, wild garlic, crab, langoustine, dirty steak, rhubarb, gin, peanut butter and tea. Who better than Chris Toner and Team AK to pull together these random favourites into an innovative foodie night out. Your hosts will explain the concepts behind the dishes and showcase the local suppliers and producers who provide the highest quality of raw ingredients right here on our doorstep.